A new device will allow researchers to take 3D images of single cells or organisms using only a cellphone. The device uses acoustic waves to vibrate trapped bubbles in a series of small cavities. The vibration creates microvortexes in the flowing liquid that are tunable so the sample rotates in any direction and at any desired speed. “Currently confocal microscopes are required in many biological, biochemical, and biomedical studies, but many labs do not have access to a confocal microscope, which costs more than $200,000,” says Tony Jun Huang, a professor of engineering science and mechanics and chair in bioengineering sciences at Penn State. Huang and his group created the device called acoustofluidic rotational manipulation (ARM). To demonstrate the device’s capabilities, the researchers rotated C. elegans, a model organism about a millimeter in length frequently used in biological studies. They also acoustically rotated and imaged a HeLa cancer cell. (a) A schematic of the experimental setup. 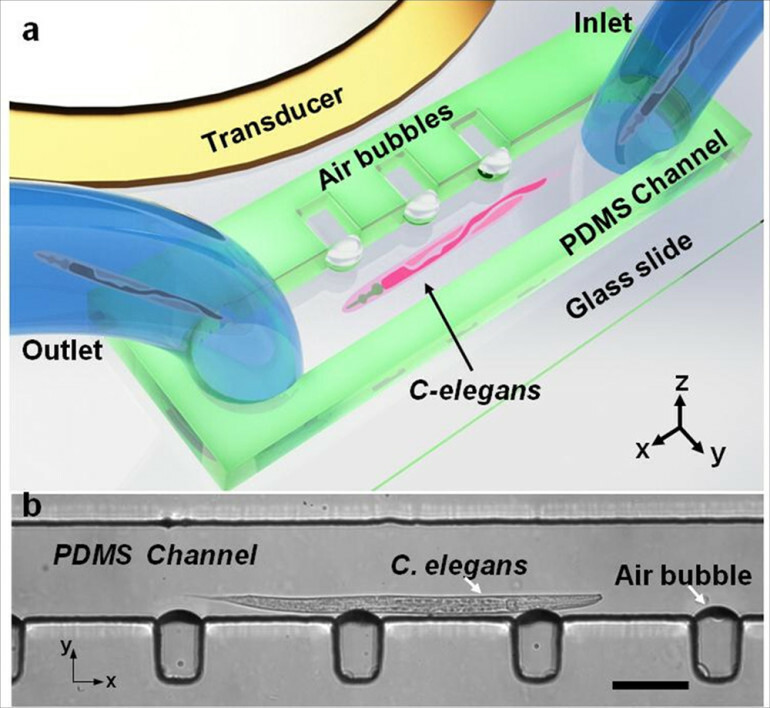 The piezoelectric transducer that generates acoustic waves is placed adjacent to the microfluidic channel. The acoustic waves actuate air microbubbles trapped within sidewall microcavities. (b) An optical image showing a mid-L4 stage C. eleganstrapped by multiple oscillating microbubbles. Scale bar = 100 μm. Existing methods of manipulating small objects depend on the optical, magnetic, or electrical properties of the specimen, and/or damage the specimen due to laser heating. The ARM method, on the other hand, uses a gentle acoustic wave generated by a power similar to ultrasound imaging, and at a lower frequency. The device is also compact and simple to use. The National Institutes of Health, National Science Foundation, and the Center for Nanoscale Science at Penn State supported the work.